A father and son team, Dominic Lowe and Jon Lowe (also called Dominic), painstakingly laid a garage floor out of 33,000 2p coins in perfect symmetry. 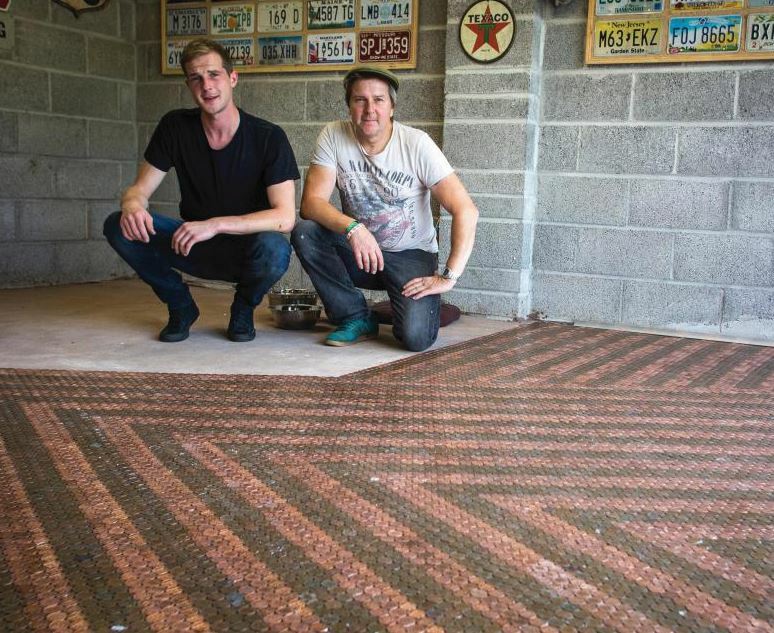 The two men spent a month building the first half of the garage floor out of coins and the effect is striking. The father and son team created a mosaic effect with the 2p coins by gluing down each coin. To get the coins to shine extra brightly, they soaked them in Coca-Cola before sticking them to the garage floor. Some of the coins were polished, while others were left dull in order to create the two-tone effect. Once the flooring project in their Pensford, Somerset home is complete, approximately 33,700 coins will be glued to their garage floor. Dominic had the brainwave to use coins to mosaic his garage floor after seeing a post on Facebook. The total cost of the project is approximately £670 (R12 000), with friends having donated spare change, strangers approaching Dominic in the street to give him their change, and the younger siblings in the Lowe household helping to collect coins. “I wanted to put the coins in a pattern – I think it reminds different people of different things. For some people it’s like the pyramids, inside the tombs. In the evening the sun comes through the windows and bounces off the metal – it’s beautiful,” commented Dominic. Full thanks and acknowledgement are given to www.thesun.co.uk for the information contained in this article.